The first Volvo FH16 750 was delivered to Freightlines in May. The FH750 is the highest horsepower production truck in the world and boasts 3550nm of torque. 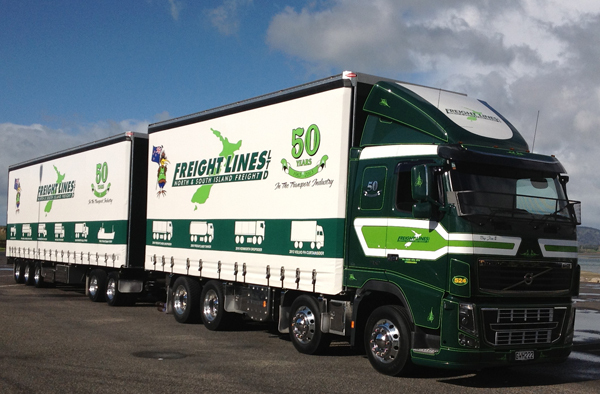 This is the first 750 in New Zealand and MTD Trucks has partnered with Freightlines Group to evaluate the truck on our roads. The Volvo Dynafleet telematics system is live on board and monitors the truck 24/7 feeding vital operating data back to MTD. This data, along with valuable service information being provided by Truck Stops Branch 27 who are responsible for its maintenance will provide a sound view of the trucks performance an capability in our part of the world. MTD and Volvo Truck Corporation will use this data to determine if the 750 will be made available in our standard model mix in the future. This is the first time such a project has been undertaken here and to date with over 10,000km on the clock the truck has performed perfectly.